Make Practicing Scales and Fundamentals Fun! Yes, fun! You heard me, learning music theory can be fun, if the teacher can relate to the student and has the creativity and a sense of humor even the most boring of rout scales can enjoyable. Music teachers and instructors can instill in a love of learning basic music fundamentals by taking a creative approach learning scales, chords and theory can become enjoyable instead of a drudgery. Music fundamentals are essential to the development of all serious-minded musicians. Basic fundamental techniques, concepts and rudimentary information in all areas of music such as performance; theory;composing/arranging; recording; etc., must be mastered prior to functioning at a more advanced level. For instance practicing scales can be one of the most boring parts of practice. What about making it into a game, or a Skittles reward, at the end of the piano scale run you eat a Skittles (obviously this won’t work for woodwind instruments). Or, what about adding a little style and rhythm to your scales with a few staccatos, jazz it up a bit and those scales will start to play themselves. What Are You Doing as a Teacher to Make Fundamentals Fun? Leave a comment below on what you do to encourage building basic music fundamentals and what work for you. Don’t forget, the poster above is available for sale at J.W. Pepper and would make a great addition to a practice room to remind students that yes, fundamentals are the building blocks to every great musician. Categories: Motivational Posters, Tips for Musicians | Tags: fundamentals, music, music fundamentals, music poster, music teachers, musicians, posters, practice, scales | Permalink. One skill musicians need to learn is how to focus. In every facet of life learning to focus on one task, or prioritizing high payoff activities is a challenge, especially in the social media world in which we live. Our lives are surrounded by technology, cell phones, instant Facebook notifications, tweets, beeps, and this overload of stimulation makes it a challenge to stay focused. Research done by Scientific Reports has proven that listening to music you like actually improves focus. It is ironic that the same trait which make musicians creative individuals also work against us in our struggle to FOCUS. Yes, I said it, musicians and artists have a higher incidence of ADD (attention deficit disorder), but does that really surprise you? Those that maintain their musical focus. Those that lose their musical focus. Musicians that possess a bona fide ability to maintain their focus when performing are inclined to play accurately and maintain a high level of musical excellence. These musicians remain poised, relaxed and confident throughout their execution of the music, because they rely upon their training, preparation, composure and ability to remain focused as they navigate comfortably throughout the entirety of the composition. Alternatively, musicians who for one reason or another have not developed the ability to remain focused during a performance, tend to play inaccurately and are prone to losing their place within the music. Moreover, when they perform, they are very susceptible to the infamous “crash-and-burn syndrome,” which can totally derail their performance with catastrophic results–something to be avoided at all costs! In some instances, musicians that fall into this latter category can overcome their lack-of-focus, which often results in performance anxiety and other musical insecurities, with proper training from a skilled professional musician. In addition to developing more consistent musical focus with the input from an esteemed professional in their field, they need lots of experience performing in front of people in a variety of contexts and venues in order to better solidify this technique. Categories: Life Lessons, Motivational Posters | Tags: add, attention, creativity, focus, life, mallet, music poster, musicians, performance, priorities, social media, vibraphone | Permalink. With music programs being one of the first programs eliminated during budget cuts, the importance of how music stimulates brain functioning and social development becomes even more relevant today. Music 4 Life, LLC was created with the intention of increasing the perception and importance of Music Education within our school systems. Research has shown that music not only impacts academic achievement, but contributes to brain development and improved interpersonal skills. Moreover, it is well known that music affects artistic sensibilities such as mood and feelings, but research in children who are engaged within musical activities also show a significant improvement in language and mathematical abilities. A series of motivational posters were created to draw awareness between music education and its cross-disciplinary benefits. The Music 4 Life motivational messages are not only timely, but when they are placed within classrooms, music studios and practice rooms, they serve as a subtle reminder to all participants that the musical journey and its benefits transcend the notes on a page. The partnership of Music 4 Life, LLC with J.W. 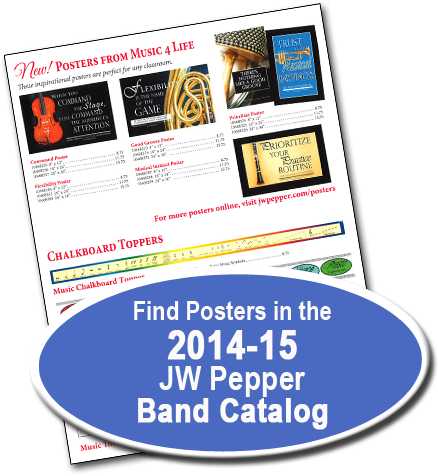 Pepper, the leading supplier of sheet music in the world, makes music-themed motivational posters easily available to public schools, band directors, private music teachers, and other educators. Most messages are cross-curricular and emphasize leadership, respect, responsibility, practice, and hard work as traits necessary to succeed. Five posters from the Music 4 Life, LLC inventory will be featured in their Fall 2014-15 Band catalog and all 40 posters available are on their website at www.jwpepper.com. Since 1876, J.W. Pepper & Son has been a family business with a commitment to customer service, value and satisfaction. They are the leading music supplier for concert bands, choirs, church musicians and a source of news and information on state music festivals across the United States. Categories: News | Tags: distribution, music, music education, musicians, nebraska, news, Omaha, press release, schools | Permalink. Steve Raybine is a virtuoso vibraphonist; percussionist; composer/arranger; instructor and clinician. He received degrees from the prestigious Eastman School of Music, University of Wisconsin-Madison, and the University of Iowa.